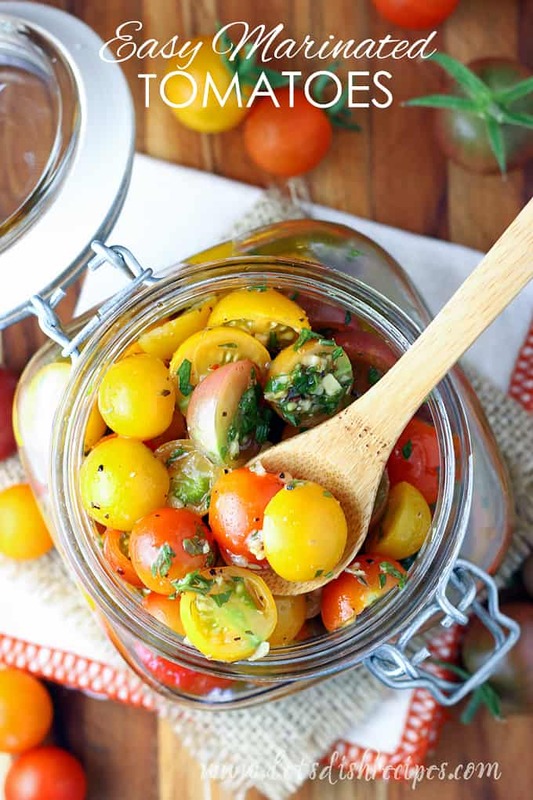 EASY MARINATED CHERRY TOMATOES — Cherry tomato halves are marinated in herbs, garlic and olive oil for a healthy, delicious appetizer or side dish. These tomatoes are also great in salads, tossed with pasta, or as a topping for grilled chicken. Way back in the spring, I planted four tiny little tomato plants. Those plants have now taken over my garden and I have cherry tomatoes of all sizes and colors coming out my ears! 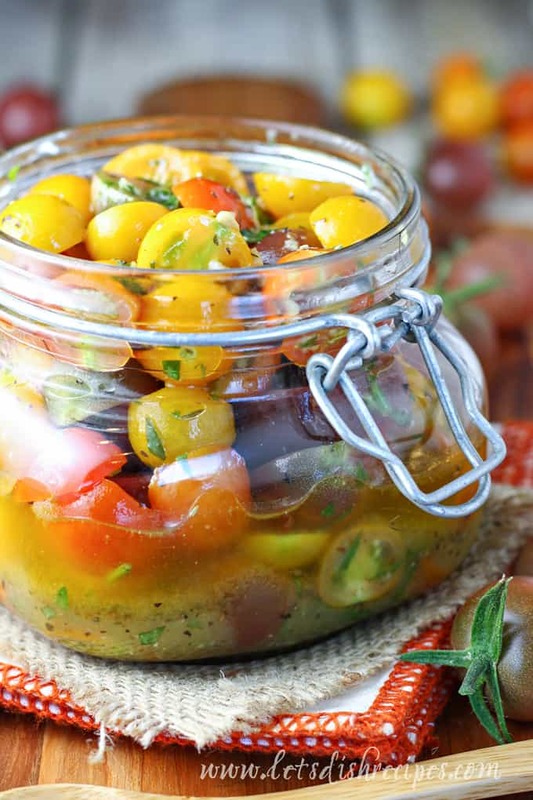 And this Easy Marinated Cherry Tomatoes recipe is my new favorite way to use them. I not much into canning, but I can whip up a batch of these marinated tomatoes in about 15 minutes and enjoy them for several days afterwards. Also, your neighbors will not complain if you fill a jar with these tasty tomatoes and share. They’re great on salads, with pasta, over grilled chicken, or eaten straight from the jar with a spoon. Which is usually how I enjoy these tomatoes. They are literally bursting with flavor, and the olive oil and vinegar marinade, made with fresh parsley, is the perfect accompaniment to tomatoes fresh from the garden. Sometimes, the best things in life are the most simple. 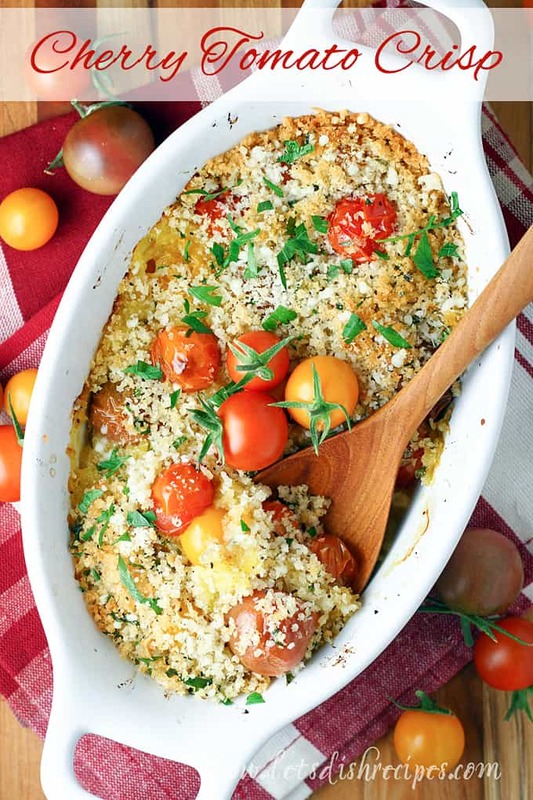 Absolutely any kind of cherry tomatoes will work in this recipe. But I do love using a few different colors if possible. Because it just looks so pretty! I have tons of fresh parsley in my garden at the moment too. But fresh basil is another great option. Feel free to use both if you’d like. If I’ll be using these tomatoes right away, I like to let them marinade at room temperature for at least a few hours. If not, they can be stored in the refrigerator to marinade overnight. The flavor will only get better the longer they sit. However, if they’ll been refrigerated, you’ll want to bring them back to room temperature before serving, since the olive oil will become somewhat solidified. 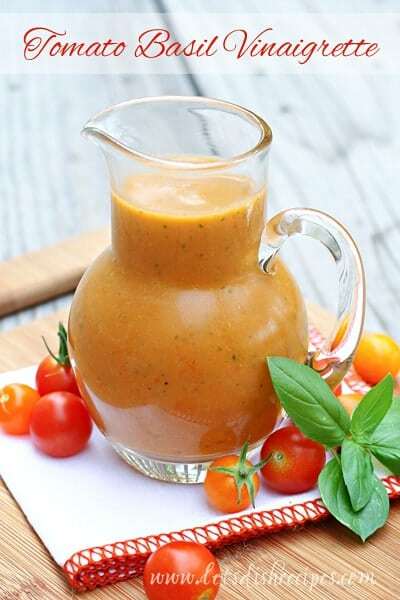 Oh, and if you want to throw this recipe together even faster, just toss your tomatoes with some pre-made Italian dressing. I don’t always have that handy, but I always have olive oil and vinegar. Either method will result in some savory tomato goodness. 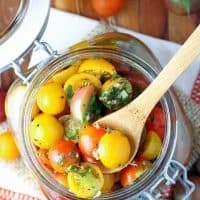 If you’re swimming in cherry tomatoes like I am this summer, these marinated tomatoes are a quick and easy way to use them up! Enjoy! Be sure to save this recipe for Easy Marinated Cherry Tomatoes to your favorite Pinterest board for later. 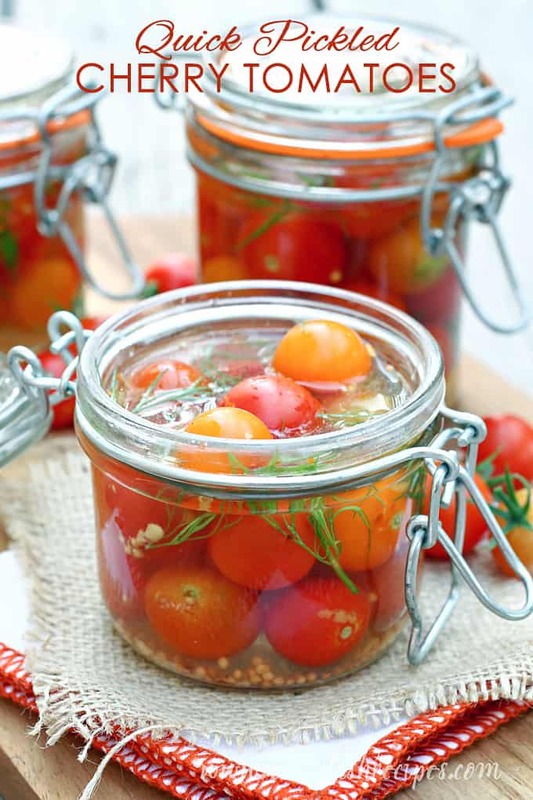 Cherry tomato halves are marinated in herbs, garlic and olive oil for a healthy, delicious appetizer or side dish. These tomatoes are also great in salads, tossed with pasta, or as a topping for grilled chicken. In a large bowl, whisk together olive oil, vinegar, garlic, Italian seasoning and parsley. Gently stir in cherry tomatoes. Season with salt and pepper, to taste. Transfer to a covered container and marinate for at least 2 hours. Refrigerate if marinating longer than two hours. Bring to room temperature before serving. Oh man! Good luck….I could honestly spare a few of mine to the chipmunks. Haha!